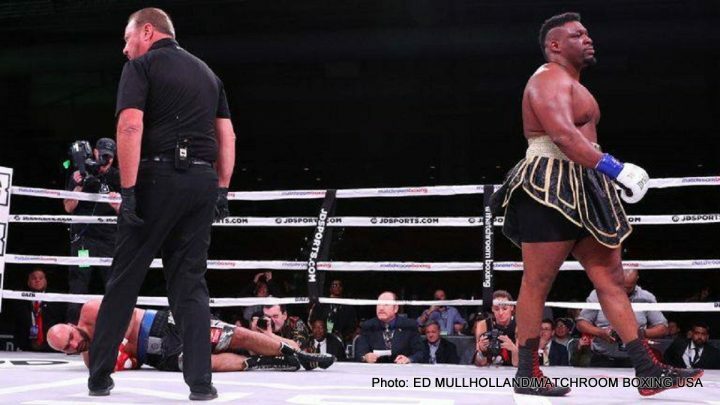 By Tim Royner: Jarrell ‘Big Baby’ Miller’s promoter Eddie Hearn believes the 315 lb New Yorker is ready for a world title shot against one of the heavyweight champions following his 4th round knockout win over Bogdan Dinu last Saturday night. Dinu as found by Hearn for Miller to fight on three weeks’ notice, and he wanted the World Boxing Association to bless the fight for the vacant WBA heavyweight title. The WBA chose not to make that move given that Bogdan, 33, was little more than a last minute option for Miller to fight rather than a fighter that had earned the right to fight for a world title. Miller smashed Dinu to the deck twice in the 4th round last night to pick up his third win of 2018. Miller’s wins in the past year has come against former heavyweight word title challengers – Gerald Washington, Mariusz Wach, Johann Duhaupas and Thomas Adamek. That doesn’t necessarily mean that Miller beat anyone talented. Those were all largely weaker heavyweights from this era. Hearn chose not to match Miller against Luis ‘King Kong’ Ortiz or Joe Joyce. Both of those fighters would likely have jumped at the chance to fight the heavy, slow-moving Miller if Hearn had let them. Miller is a good heavyweight, but he’s slow, easy to hit and too reliant on inside fighting. In other words, Miller needs to be matched against stationary heavyweights that stand in front of him for him to do well. Duhaupas had Miller looking frustrated and confused with the little bit of movement he showed him in their fight earlier this year in April. Miller wants to fight Anthony Joshua next, and if he’s not available he wants Dillian Whyte, who is promoted by Eddie Hearn as well. Miller would also like a title shot against WBC champion Deontay Wilder. However, he’s fighting on December 1 against Tyson Fury. If Wilder wins that fight, he’ll likely be ordered by the World Boxing Council to defend against mandatory challenger Dominic Breazele. Whyte, 30, is out of the question for a fight against Miller, as Hearn is interested in matching one of those two against Joshua on April 13. Hearn can’t have Whyte and Miller wiping each other out, since he’s interested in using both of them as opponents for Joshua to fight in 2019. Hearn is not going to let Whyte and Miller go at it before he matches them both against Joshua. He’s also not going to risk putting Miller in with Wilder, because he’s too slow and easy to hit for him to have much of any chance against the much faster, stronger and taller fighter. Deontay Wilder is rumored to have concussed Miller during a sparring session not long ago. It might not be a good idea for Hearn to try and push for that fight. Since Hearn isn’t interested in matching Wilder against IBF/WBA/WBO heavyweight champion Anthony Joshua (22-0, 21 KOs) on April 13 for his next fight, Miller would be an upgrade over Dillian ‘The Body Snatcher’ Whyte, who Hearn has been chomping at the bit to match against AJ on that date. The fans would rather see new blood in with Joshua rather than watching Hearn trot out Whyte for another go around. If Whyte had beaten someone good to redeem himself after his knockout loss to Joshua in 2015, then the fans would be willing to sit through a needless rematch between the two. The problem is, Whyte’s only quality opponent he’s faced in the last two years is Joseph Parker, and his victory over him last July was controversial due to the referee blowing a knockdown call in the 2nd round. You can argue that there needs to be an asterisk in the record books about Whyte’s win over Parker because of the job the referee did in that fight. It’s unclear where Hearn thinks he’s going to turn Miller into a star. He’s got a chance of turning Miller into a star if he has him fighting in the UK against the same type of heavyweight opposition that he’s been feeding Dillian Whyte, but he probably won’t ever become a star in the United Stares where fans are a lot more choosy in who they back. For Miller to become a star in the U.S, he’s going to need to face much better opposition than Bogdan Dinu, 41-year-old Tomas Adamek, 38-year-old Mariusz Wach, 37-year-old Johann Duhaupas, 36-year-old Gerald Washington and 39-year-old Fred Kassi. Those are Jarrell’s last six opponents he’s faced since 2016. It would have been nice if Hearn mixed in some quality opposition for Miller to fight like Luis ‘King Kong’ Ortiz, Alexander Povetkin or Kubrat Pulev. At this point, boxing fans would be happy just to see Miller fight Joe Joyce, but he’s not keen on fighting Joyce for some reason. Miller might be able to beat some of them, but not likely all of them. Wilder, Joyce, Ortiz, Povetkin, Kuzmin and Pulev would all have a great chance of beating Miller.